As you can see, turnout for the Independence Referendum was both astonishingly high and way off-trend. In addition to the long-term decline in participation, there seems to be a hint of a discontinuity in turnout post-1997, maybe after the second Devolution referendum. (Perhaps those more knowledgeable about Scottish politics can say more.) And of course you can also see that nobody cares about European elections. I have a terrible idea! Maybe we solve the problem of low voter turnout at EU elections by making each one a referendum on staying in the EU! Every election a separation election! Note about the first plot: for awhile I thought that the labeled point in the upper right was a legend, showing the color of the independence referendums, which then, referring to the body of the plot, seemed confusingly to occur multiple times in the 2000’s. I may not be the only idiot among your readers. And of course you can also see that nobody cares about European elections. Not surprising when you consider the European Parliament can’t actually propose laws. At best they might be able to stir up stuff by blocking appointments. People will vote when they feel that something significant actually rests on the outcome and aren’t being forced to choose between two or more venal and despicable power hungry arseholes? This is in line with the argument that voters are increasingly turned off by the choices available. The Russians are claiming the turnout is suspiciously high….. Voters don’t see anything big at stake in normal elections, but find secession a big deal. I don’t think either part of that is counter-intuitive. Too many years ago, in the mid-1970s, when the declining trend in turnout was still only in its early phase, I actually compared what was going in in Scotland, Wales and the regions of England. 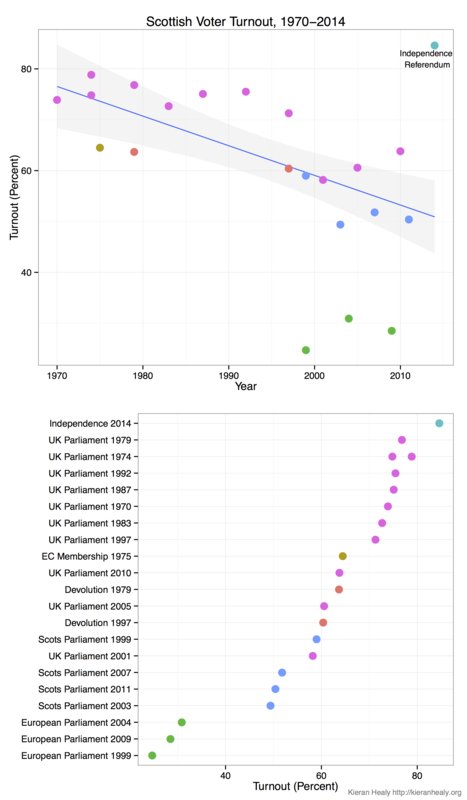 At that time it was quite apparent that if the gains of the then small and widely ignored Scottish National Party were set aside the trends of decline were pretty similar in all parts of GB. (I say GB rather than UK because I just couldn’t figure out how to deal with the British part of Ireland–how even now does one say that in a politically unloaded fashion?) It was also rather clear, as I recall, though the trends of decline were less even, going down in fits and starts from one General Election to the next, that both the Tories and Labour were in decline. As to the large turnout for this referendum, I suppose when your entire political future seems to be on the line there’s a bit more interest in trying to get the outcome you want. Maybe, when the Labour Party, especially, seemed to stand for something, when it hadn’t yet become just a mechanism used by professional politicians to gain access to the top political jobs, General Elections had something of the consequentiality that the Referendum did? Maybe that’s why post-War turnout wasn’t so different from what we saw yesterday in Scotland? how even now does one say that in a politically unloaded fashion? Serious question. Why would we take the Russians at all seriously about holding valid elections? We know they faked both the Crimean and Donetsk/Luhansk referendums, and that they fake their own elections. The Crimean vote for example, claimed 97% in favor with 83% turnout, even though the Crimean Tatars boycotted the poll. Crimean Tatars are not of a single mind. Rather, what happened there was that the organization called Mejlis, that claims to represent the Crimean Tatars as an ethnic group, called for a boycott of the referendum. On the ground reporting showed very low turnout in Crimean Tatar areas, which then very suspiciously reported high turnout. The Crimean Tatar vote was faked. It’s impossible to know what a real Crimean referendum result would have been without stuffed ballot boxes and armed intimidation. I think some people have failed to notice the sarcasm in the ‘Russian turnout’ comment…. On the ground reporting by Mejlis, no doubt? Actually, it’d be quite easy to estimate the results, if you were a Crimean. I’m not, but I know a few. They would prefer to be in the RF anyway (the language, higher standard of living), but after the February coup in Kiev it was just a no-brainer. All the politicians they voted for got kicked out of the government, overnight, replaced mostly by politicians from Svoboda, the party that got (in 2012) ~40% in Galicia and ~1% in Eastern Ukraine and Crimea. Or so I hear anyway. U can never please everyone, but that doesn’t really matter. ‘Norn iron’ is the best bet. I would suggest that you refer to non-Russian media sources. I highly doubt that you know what you are talking about, especially because the last time Crimea was ruled by Moscow, they were all deported to Central Asia, 50% of them died, and they were only allowed to return en masse to Crimea when it was part of independent Ukraine. You do remember the massive Crimea Tatar protest that prevented the initial seizing of the Crimean parliament, right? The current regime in Crimea just occupied the Mejlis, and refuses to allow Crimean Tatar leaders to return to Crimea. They prevented a commemoration of the Crimean Tatar deportation this year. By the way, you do know that the Crimean Tatars have their own language, called Crimean Tatar, very close to Turkish? But I suspect you are unpersuadable on this issue, so I will just predict that Crimean Tatar social rights will not be protected in a Russian-ruled Crimea. Ukrainian and Crimean Tatar language schools will be closed, and anyone involved in Ukrainian or Crimean Tatar social organizations will be targetted. Crimean Tatar land claims will be rejected, and the overall social repression on anyone who wishes to have a Ukrainian or Crimean Tatar identity will rachet up higher and higher. “last time Crimea was ruled by Moscow” – you do realize that ‘Moscow’ is just the name of a place, right? Not a political ideology. Or do you believe that people living in that city are genetically predisposed to savagery? Just curious. My comment 15 was about the people of Crimea, Tatars and non-Tatars. Only 10% of them self-identify as Tatars, so even if every single one of them boycotted the referendum, an 83% turnout doesn’t sound completely outlandish. But then again, most of what you’re talking about is only a political organization, ethnicity-based political organization, Mejlis. Indeed, its future appears to be problematic. Sorry if that upsets you. This post is more evidence against what Mrs. Thatcher said about a man who takes a bus. Russian political organizations OTOH are not ethnic, because ethnicity is a characteristic of the weirdoes who can’t or wont assimilate to the dominant group. Well, it’s seldom that rigged show elections produce results that are mathematically impossible, such as 102% turnouts. But, when a police state notorious for rigging elections invades a neighboring country, holds a referendum on whether the invasion was welcome, and gets a massive turnout with virtually everybody voting in favor of the invasion, you gotta be a bit suspicious. Some are, I suppose. But I sure hope that a vast majority of the Russian (i.e. of the Russian Federation) political organizations are not linked to ethnicity. Look, obviously the victims of stalinist repressions should be justly compensated (which is, as I understand, the main issue), but I don’t think approaching this cause as an inter-ethnic conflict is particularly fruitful. There has to be a better way. Not necessarily; it depends on the totality of the circumstances and your perception of the prevailing sentiment in the area. There was recently a referendum in the Falkland Islands, which some say are illegally occupied by the UK, with 92% turnout and 100% pro-UK vote. But the fact remains that the Russians are notorious for rigging elections, have a long history of it, so ANY election they hold starts out suspicious. “Northern Ireland” is now OK within the Dublin Consensus. “Northern Irish” is still dodgy, mind. It’s not even a question whether the vote was rigged. This is separate of whether the referendum would have passed with an honest vote, without blatant rigging and heavily armed Russian paratroopers everywhere. Turnout was mathematically too high in certain districts. Go look at the reports in anything but the Russian media. Crimean Tatars are at about 12% (the figure of 10% is from 2001) and Ukranians are at 24% of the population. Until the Russian invasion, the Crimean Tatars were increasing and all the other demographics groups were dropping in population. So the argument is that the Crimean Tatars boycotted, and the vast majority of the Ukrainians voted to join Russia and leave the country they most identify with, and every single Russian voted to join Russia. It’s not believable. The Soviet Union made it an ethnic issue. It rounded everyone up based on their ethnic identification and deported them, killing half of them, and then prevented them from returning. Crimean Tatar were singled out for their ethnicity. And now, the Russian state won’t let them commemorate their deportation publicly, and various prominent Crimean Tatars have been refused entry to Crimea or deported. The Crimean authorities just shut down the main Crimean Tatar library on a pretext. The United Nations has already voiced serious concern at the level of harassment and persecution against Crimean Tatars wince the Russian annexation. Sure seems like an ethnic thing to me, at least from the Russians. According to wikipedia 77% of the Crimean population named Russian as their native language, including 60% of those who identified themselves as Ukrainians. On February 23, 2014, the second day after the flight of Viktor Yanukovich, while in session of the Ukrainian parliament a deputy from “Batkivshchina” party, Vyacheslav Kyrylenko moved to include in the agenda a draft that would repeal the 2012 Law “On the principles of the state language policy”. The motion was carried with 232 deputies voting in favor, the draft was included into the agenda, immediately put to a vote with no debate and approved with the same 232 voting in favor, making Ukrainian the sole state language at all levels. Aside from that, the perspective of doubling one’s wages/pensions would certainly seem like a strong incentive to vote for joining the RF, regardless of one’s ethnicity. You can treat it as a never-ending ethnic scuffle, or it could be an issue of justice for the victims of repressions. Mejlis was trying to exploit the russophobia of Ukrainian nationalists in Kiev, but now it’s a whole different game. Mejlis failed and harmed its constituency. It happens. It precisely isn’t a never-ending ethnic struggle. Under Ukrainian sovereignty, ethnic tensions were reduced and the Crimean Tatars had more cultural rights. With the incorporation of Crimea into Russia, ethnic repression of Crimean Tatars is increasing. There is a strong correlation with ethnic repression of Crimean Tatars and rule from Russia. It would be nice if the current administration was (as was promised by Putin) willing to safeguard ethnic minorities in Crimea, but that increasingly appears to not be the case. Right now, there is no justice for victims of repression, and there is ethnic repression in Crimea. I agree that language is a very symbolic issue, which is why it is unfortunate that Russia is closing Crimean Tatar language libraries and Ukrainian and Crimean Tatar schools. I predict that it’ll change soon. Neither RF nor Crimea benefit from ethnic tensions in Crimea. The leadership of Mejlis will change and employ a better strategy. Dzhemilev will become irrelevant, traveling professional denouncer of Russian imperialism, like Saakashvili. This is just a transitional period. I checked their website. It says that due to the administrative change the library has been renamed from “Gasprinsky Crimean Tatar Library” to “Republican Gasprinsky Crimean Tatar Library”. The library is open as usual and welcomes its readers. IOW, western media are lying. Websites anywhere in the former USSR are not necessarily accurate. Crimea is irrelevant to the Scottish referendum my friends; The UK is a Liberal Democracy with the rule of Law. Russia is not. Either side can raise irregularities concerning elections to the counting officials and the courts. Neither side has done so. I agree that the racist Russian state should stop stealing other countries land and oppressing their people. They should atone for their crimes and apologise for Stalin. But the far right United Russia party has based itself on revisionism of history and renewed imperialism. Alex Salmond showed contempt for the idea of Democracy by having no plans it seems about making this real. He wanted a blanc cheque to ask for who knows what while presumably people and firms would be removing their capital. If you want to win independence you need to look like your ready for the big time not a romantic fool with no central bank to back your currency or ability to resolve the legal and economic problems which may arise both domestically and in terms of international law and obligations. I was sceptical of the idea that some socialist utopia would come about in the event of separation. How such a result is to be produced is a mystery to me. As is the amazing ability of educated people to appear so confused about this and to sweep away practical problems with a utopian wave of the hand. I cannot be the only person to be doubtful about the utopian effects of a nationalist panacea for all ills. If you want to win independence you need to look like your ready for the big time not a romantic fool with no central bank to back your currency or ability to resolve the legal and economic problems which may arise both domestically and in terms of international law and obligations. Clearly then, next time Scotland should establish a central bank and a currency first, and establish embassies and set up international treaties etc in preparation for the vote. What Keith@33 said. But still, I wonder. How quixotic did the U.S. Declaration of Independence seem at the time to many, perhaps most? (I pose this question as someone who sympathized with the nays, btw.) But even if we could calculate now the quixotitude (much less if they could have calculated it then!) — well, neither we now nor they then could measure it. and thus claim the king has abdicated/needs to be overthrown all to try to get to wield the power of the crown yourselves and subjugate and dispossess and injure and steal land, labour, and resources from as many unlucky people under you as you can and extend this as far around the world as is possible , which is quite far as it happens sadly, and then also into outer space , which so far has disappointed but there is that Mars excursion coming up I think. All the while emitting lots of ghg so as to irrevocably ruin the climate within one generation (25 years) from now likely to spite any future people who might have had more pleasant characters and looked on all these goings on with moral censure. Next I might learn from China engaging with Japan and say how our Australian feelings are so very injured by all this glossing over England’s grievous 5 centuries of imperial wrongs . Meredith @37: The U.S. declaration of independence was signed more than a full year into a hot war between colonists and the crown. Lexington and Concord took place on April 19, 1775, and there were multiple sieges and battles throughout 1775. The Declaration of Independence just made it official. The whole campaign could have been called quixotic at the time surely, but by the time the Declaration was signed, it had already become clear that there was no simple peaceful resolution to be had. Well, what other explanation is there for UKIP receiving the greatest number of votes in the UK Euro elections? We wouldn’t, of course. But they most definitely are experts about holding _invalid_ elections, and therefore their comment bears consideration.